Rhodes even acknowledges that there is nothing “moderate” about Rouhani, Zarif or Khamenei. In the midst of his fawning profile, Samuels exposes a number of lies behind the Iran narrative, or rather quotes Rhodes himself doing so. For instance, the first outreach to Iran came 2012, not in 2013. I’d bet it came even earlier. Rhodes even acknowledges that there is nothing “moderate” about Iranian leaders Rouhani, Zarif or Khamenei. But these dates and facts conflicted with the narrative, so they were finessed, rewritten and sold to the public with different plot-lines and different themes. Outside Washington, D.C. this behavior is sometimes called lying. Rhodes’s narrative is not even particularly good fiction. Mistaken identities, fudged timelines, villains in disguise, and a two-dimensional hero are clichés. But the quality of fiction does not matter as long as consumers line up to buy it. And this is where Rhodes truly excels, as a relatively shallow thinker, adroit mostly at influencing even shallower thinkers and hoodwinking people too busy to bother learning. In his daily conversation, Samuels tells us, Rhodes lumps together nearly everyone who came before Obama (Kissinger, Clinton, Bush, Gates, Panetta) as “the Blob” — the establishment that damaged the world so badly that only a magical hero can repair it. Rhodes tells Samuels that the “complete lack of governance in huge swaths of the Middle East, that is the project of the American establishment.” This is what happens to foreign policy when it is entrusted to the unqualified and undereducated. 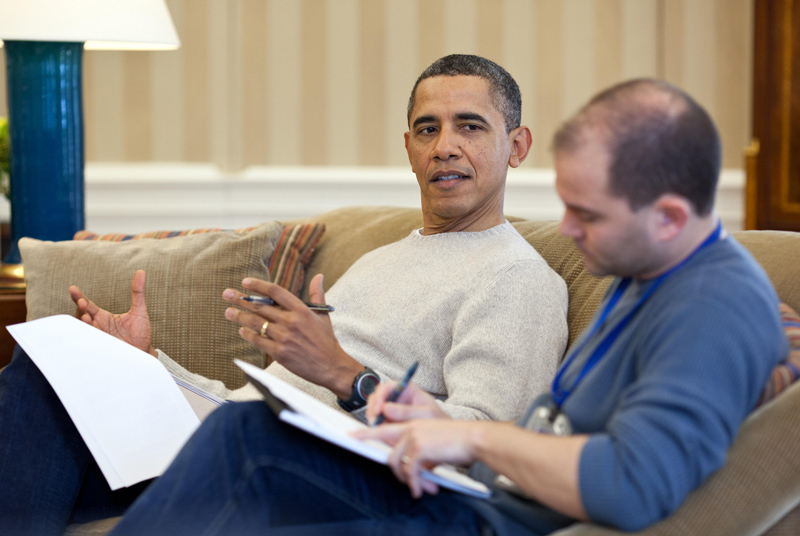 In eight months, Ben Rhodes can get back to his former life — as he puts it, “drinking and smoking pot and hanging out in Central Park.” And presumably writing more fiction — this time perhaps the honest kind that does not pretend to be non-fiction. The entire world, except perhaps the world of fiction, will be better for it.